Remove the ribbon. This is easy enough on practically any typewriter. Here, it is hooked/caught at the front so using both hands you can lift up to bring it out of the first hook then down and back to remove it completely. From there the spools simply come out. Remove the lid. Here I used a pair of pliers to gently bend the left side holding section toward the inside while lifting up on the lid a bit. It came free with little effort this way and allowed the right side to slip free. The bending was gentle enough to not cause any damage or deformation. From here you can go two routes. 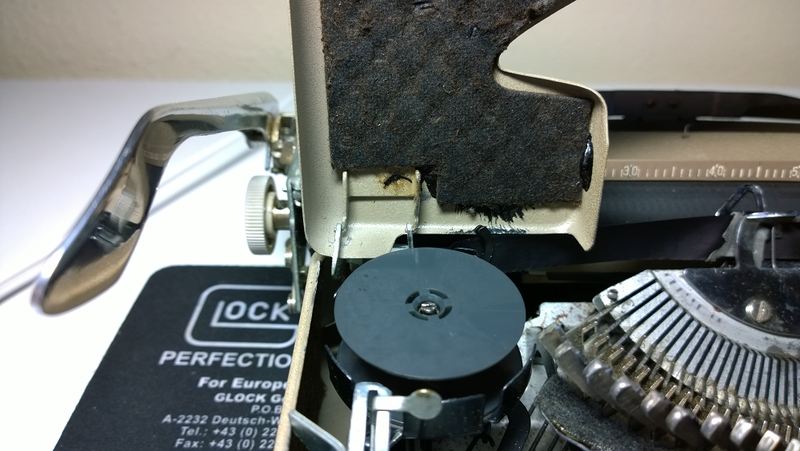 One just adds a step that isn’t entirely required, but it does allow you to see the ribbon automatic rewind mechanism better — which may need some attention, like this one does. I am including it here as a step to be more thorough. Spool cradles. (Optional) 4 screws in total, 3/16. The left side requires the loosening of the screw that holds the touch regulator/adjustment in place. (Do not remove at this step!) This screw requires a 1/8. Retighten after cradle is removed. Platen. This is the part everyone loves to seem to do — and I don’t disagree at all. I think it’s mainly because it really shows you’re doing something… fancy, I guess. Lift the paper ruler up and turn the platen to reveal the right set screw — loosen 1 turn or 2 using a 5/64 or thereabouts. Gently pull and the knob will come free. (May require a bit of wiggling, but it will free itself.) The left knob comes off in a similar fashion revealing the rod. The rod on this model does not come out! Lift the right side up as you push on the rod gently; the platen will come free. It may grip on a roller that controls weither it can spin freely or not. Simply push the roller down and to the left so it is out of the way. Platen support. This can now be removed as one unit with a little wire. I used 22AWG from my soldering kit. A length of no more than 6 inches (~15cm) is really all that is needed — more if you want more grip. Drop the support so it rocks freely. Thread the wire under the hook of the spring then, while keeping the support steady, pull up on the wire and the spring will unhook. String works here too, but you risk fibers begin caught. Once the spring is free, the support may be rocked forward and lifted simultaneously to lift it out of the machine. The support is actually rather neatly done physically in that the spring places a pulling force upon it which causes it to stay put within the two prongs on either side. Between the prongs and the metal segments that go into them, it creates a durable pivot point. Back plate & paper margin stops. This requires a 1/8 or 3/16, your choice, so long as either can fit through the hole. Remembering how this is assembled is important as these two screws alone hole the back plate and the paper margin stops! Take a picture and/or make a note. Loosen the screws 2 turns each then loosen the left and right screws holding the ruler in place. The back should come loose after some wiggling and lifting up. Finish unscrewing the screws that hold the paper margin stops. Here the paper ruler may be removed using the same 1/8. First take out the left screw (keyboard facing away) and disengage the attached spring. The right side requires the use of the same 22AWG wire, but stripped to hook under and lift up the spring hook to disengage it. After that, the screw can be undone. Well! There we go! Everything that can be painted or should be painted is off the typewriter. Woohoo! From here the paper release lever can just easily be wiggled free and the return lever can be removed as one unit by taking out one screw (1/8). Hope you guys enjoyed this break down of the Skyriter. Hope y’all have a great day and be safe out there. Thanks for reading! Next up is cleaning the removed parts. Nice work. These are simple little machines, and I find it interesting that you’re working on one at the same time as me. I’m almost amused at how much of this machine is just simply 2 screws away from access. I’ll be blogging my experiences with the machine soon as well. Definitely do blog about it! Should be interesting to compare our experiences. A part of me wonders if they strived to make things simple for take-down by using a “2-screw” rule? I’m contemplating trying to tackle the segment area soon and maybe rethinking my stance on not trying to do the carriage. We’ll see… Regardless it’ll be blogged about, haha!